Confession Time: Several months ago I was having lunch with a friend and she said, “How would you like to participate in a challenge with me?” For some reason, I was immediately skeptical, “What kind of challenge?” I asked. “The challenge is to go for one month without complaining about anything?” Okay, so here’s the confession part, I declined the challenge. Before declining, however, I thought about it for several minutes, considered all the potential things I wouldn’t be able to whine about, and decided no, I don’t want to take that challenge. If you’ll recall from a previous blog, my track record with challenges that involve keeping my mouth closed haven’t gone very well. I hate to fail and was 99.9% certain that I would. I mean seriously, not complain about the traffic,the grocery store lines, the weather (this is Minnesota, after all)? Nothing? Today, I’m a little bit embarrassed to confess that I declined that challenge. I’m mean seriously, you must think I’m some sort of horrible whiner to think I can’t go for 30 days with nary a negative word? I truly don’t think of myself as a Negative Nellie, and would even say I generally see life through rose-colored glasses. But apparently, the idea of 30 days of happy, happy, sunshine put me over the edge. I’ve been reading a book this month by Nancy Leigh DeMoss titled Choosing Gratitude. Nancy talks in the book about how gratitude is something that we acquire with practice. Last year, I wrote a blog about the benefits of gratitude, and wow, there are a lot, but how does a person switch from complaining to thanking? I think it takes more than just saying to yourself, “I’m going to start being more grateful.” It’s kind of like going on a diet. Saying, “I’m going to lose some weight,” and actually doing it are two different things. If you want to lose weight you have to actually come up with an eating plan, and (here’s the hard part) follow it! Just like losing weight, showing gratitude is good for your health; physically, emotionally, and spiritually. So, if I want to give up my whiney ways I need to come up with a plan. Based on Nancy’s book, and some ideas of my own, here’s what I’ve come up with. Meditate on scripture about gratitude. – In the back of Choosing Gratitude there’s a 30-day guide to help you make gratitude part of your daily life. That seems like a good place to start. Alternatively, you could just use your Bible concordance or Google to find verses on gratitude. Here are a couple to get you started. 2. Set a reminder – Let’s be honest, just saying, “I should give thanks more” isn’t going to really help me remember throughout the day. So, I have set my phone to remind me every couple of hours to “Give Thanks.” When the reminder goes off, I immediately say, either out loud, or in my head, “Thank you God for ­­­­­­­­­­­_______.” I prefer to say it out loud, but in the middle of the grocery store, or at a concert, that doesn’t always work. You decide what works best for you. By having a reminder to give thanks, I’m hoping it’ll become a regular habit, and over time I’ll not need quite so many reminders in a day. Maybe I should add “Stop Whining” to my reminder because that is next on my list. 3. Stop Whining – Let’s be real, it’s easy to whine. Annoying situations are present ALL DAY LONG making it seem almost natural to complain. So, in the words of many great therapists: STOP IT! Okay, therapists are rarely so direct, but I’m sure they wish they could be. When I’m tempted to complain, I hope to just stop myself. Just shut my mouth and think of something to be grateful for instead. 4. 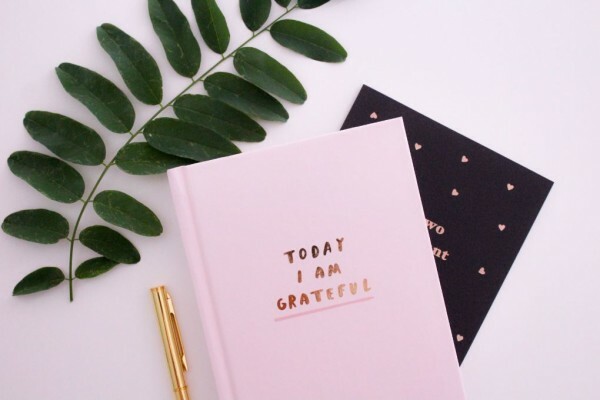 Keep a gratitude journal – Write down three things every day I am thankful for—the goodness of God, electricity, running water, sunshine, my family, my church, so many options! Writing it down will help you see that things aren’t so bad that there needs to be complaining, and will keep you more positive in general. If you do it at night right before you go to bed, you’ll sleep better. Win/win! I hope my plans give you some ideas of your own to help you grow in gratitude. It’ll draw you closer to God and basically make you a happier, and no doubt, nicer person—not that you’re not already very sweet. Thanks for your your honesty and transparency. This is a good word and reminder to put thankfulness and gratitude into action. Thanks for reading, Nancy! Maybe we can hold each other accountable. Very good read, its important to have gratitude all the time not just around Thanksgiving. I would like to read that book you mentioned and start a graditude journal as well! You’re right, Angelina! That’s my goal – year round gratitude. Be sure to buy a paper copy of “Choosing Gratitude.” I made the mistake of getting the audio book and now I’m waiting for my paper copy to arrive. Thanks Nancy. Your words were just what I needed today. I plan on getting the book. And I’m going to think before I complain (I hope to anyway) and concentrate on being grateful! I laughed out loud at your declining the challenge. I challenged myself to go a whole month without saying or thinking anything negative about other people. It lasted about 10 minutes. The first person who cut me off in traffic bore the full brunt of my dissatisfaction with his driving. sigh. On the road is a very challenging place not to be negative, Jane. There are just SO MANY people who still appear to be learning how to drive. Ha!